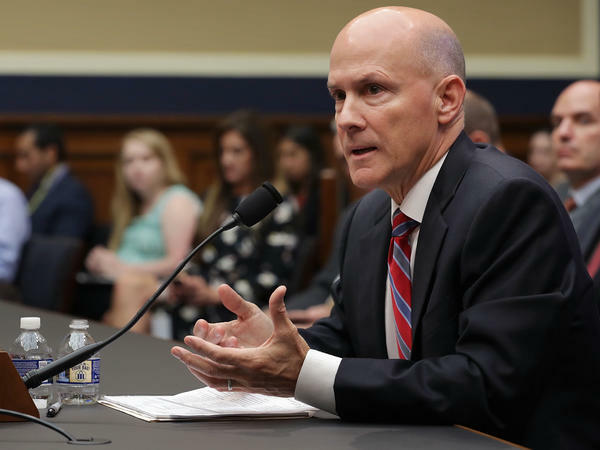 Former Equifax CEO Richard Smith testifies about the company's massive data breach before a House Energy and Commerce subcommittee on Tuesday. When corporate chief executives appear before Congress, they come braced for battle, but hope for gentle treatment. Tender handling is not what they got on Tuesday. Not from Republicans. Not from Democrats. Not when they were representing Wells Fargo and Equifax — two huge companies that recently have harmed Americans. "At best, you were incompetent. At worst, you were complicit. And either way you should be fired," Sen. Elizabeth Warren, D-Mass., told Wells Fargo CEO Tim Sloan. Sloan was testifying before the Senate Banking Committee, trying to explain the scandals that continue to plague his company. In another hearing at the same time, the former CEO of Equifax, Richard Smith, was telling a House Energy and Commerce subcommittee about how his company managed to expose the sensitive, private information involving more than 145 million Americans. The scope of Equifax's failure to protect people's privacy was "unprecedented," subcommittee chairman Bob Latta, R-Ohio, said. The breach was "also unique because of the sensitivity of the information stolen — including full nine-digit Social Security numbers," Latta said. Smith, who stepped down last week from Equifax, started by saying: "I'm truly and deeply sorry for what happened." He then blamed the massive breach on two factors: "human error and technology errors." Rep. Frank Pallone, D-N.J., said Congress should pass legislation to protect consumers whose personal data gets stolen in such security failures. "Of course, breaches will continue to occur, but they occur more often when there is no accountability and when no preventative measures are in place," he said. Equifax executives were notified of the security breach in July, but waited until August to disclose it. "Consumers do not have any say in whether or not Equifax collects and shares their data," Pallone said. "And that's what makes this breach so concerning. This is unlike any other breaches at stores like Target and Michael's where consumers could make a choice and change their shopping habits if they were upset with how the companies protected data. That's simply not the case with Equifax." Smith will have many more opportunities to explain it all; he is scheduled to testify at three additional hearings this week. Meanwhile, back on the Senate side of Capitol Hill, the Wells Fargo CEO was getting clobbered too, and not just by Warren. The banking giant, which is an NPR sponsor, has been in trouble for more than a year – ever since it revealed that its aggressive sales culture had led to the creation of millions of potentially fake accounts. Since then, other scandals have erupted, mostly involving excessive fees. Like Smith, Sloan showed remorse. "I am deeply sorry for letting down our customers and team members," he said. "I apologize for the damage done to all the people who work and bank at this important American institution. When the challenges at Wells Fargo demanded decisive action, the bank's leaders acted too slowly and too incrementally. That was unacceptable." But senators thought it was worse than unacceptable. Sen. John Kennedy, R-La., asked Sloan: "What in God's name were you thinking?" And Sen. Sherrod Brown, D-Ohio, was having none of it. "The changes Mr. Sloan and his team have made are not sufficient to reform a corporate culture that is willing to abuse its customers and employees in an effort to pad its numbers and increase executive compensation," Brown said.